With a 27-man roster, the largest in Coach David Quinn's five season tenure behind the BU bench, the 2017-18 Terriers were on the ice today at Walter Brown Arena for their initial practice. Ten newcomers—nine freshman and a graduate transfer— join 17 returnees. ►ESPN's John Buccigross posted his pre-season NCAA D1 rankings with BU at #2 behind defending national champion Denver. The two teams meet on October 27 at Agganis Arena. Two other Hockey East teams made the Buccigross top ten: #4 Providence and #9 Northeastern, while local rival Harvard is #7. 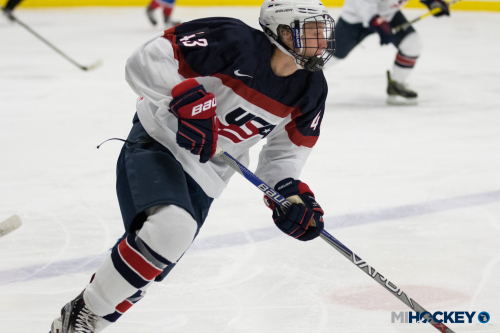 ►At the Sept. 21 All-American Prospects Game in Buffalo, freshman Brady Tkachuk and 2018 recruits Jake Wise will skate for Team Leetch while Joel Farabee and Tyler Weiss (photo), both 2018 recruits, will skate for Team Chelios.